Our two speakers, Karen Brimacombe, Chief Executive Officer for Mole Valley District Council and Timothy Jones, the Interested Party in the Leach Grove Wood case. 7. 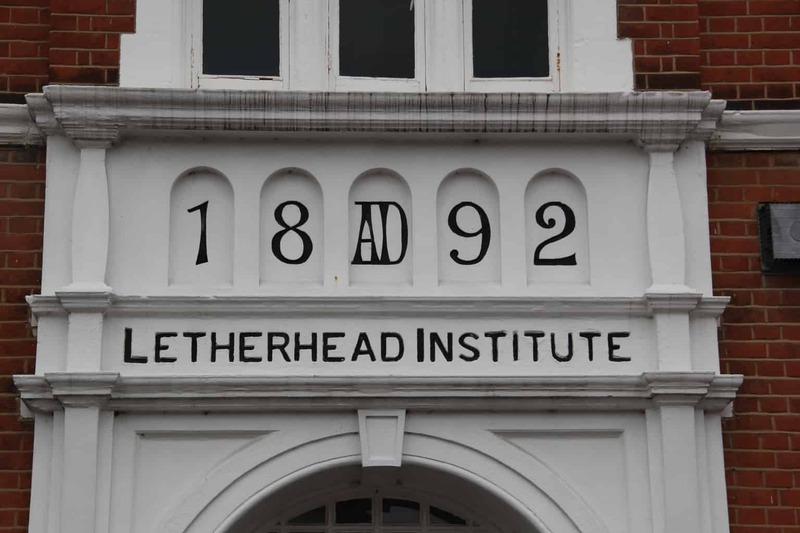 NEXT MEETING – will be on 4th JUNE at the Abraham Dixon Hall in the Letherhead Institute. There is no meeting in May. Guest speaker at the AGM will be the CEO of Mole Valley District Council, Karen Brimacombe. NB: All dates and email addresses will be put into either the Minutes or the relevant Report and will be found on the website. B. Minutes of the meeting held on 8th January. C. Matters arising from them. 11. Surrey Clinical Commissioning Group would like your views via an online questionnaire. Our March meeting will be a closed one for the Board only. The AGM this year will be in June so that our new CEO can come and meet us. There will be a normal meeting in April, but none in May. beyond me,having never cycled more than 18 miles before. The route started at the Olympic Park and ended at the Mall l,but the 46’ers turn back to London after Hampton Court. In March, I applied – then I got cold feet,but thought ‘never mind, I won’t get in anyway’, as it is a public ballot. In May I got an email saying ‘Congratulations’, and I thought‘bother (a stronger word was actually used) I’ll have to do it now’. So the 8 weeks training began – 7am on Sunday mornings is the best time to go out as there is hardly any tra c and I found a lovely route that took me to Stoke D’Abernon and over Bookham Common for my 1.5-hour training sessions. Taking the various bridleways became a bit of an adventure, as sometimes I didn’t know where I was. I also cycled this route for my 2.5- hour sessions plus going through Bookham to E ngham Junction and then onto the Black Swan pub and up to Downside and back to Leatherhead. On trying to find dierent places to go, I had some interesting experiences – a path with‘kissing gates’ to lift my bike over, paths which narrowed and had lots of nettles and a bridleway which started well and then became an assault course. My longest ride was through Esher to Bushey Park where I got a bit lost, but eventually found my way back to Hampton Court. There I crossed the bridge and cycled along the tow path –this was lovely – multi-coloured and di erent shaped houseboats I hadn’t seen before, past Sunbury Lock, and the Guildford Rowing Club was holding a regatta on the river. As this was a big undertaking for me, I decided to raise money for a charity, and contacted the Princess Alice Hospice as I drive past there on my way to work and my aunt was there about 2 years ago.They kindly gave me a cycle vest (never had one before) to wear with my name and their name on it. At a ‘lasagne evening’ I met others who were cycling the 100 route. At last, the day of the ‘event’ arrived. The logistics of getting up to the Olympic Park for the start, when roads were closed o after 5am,was interesting. I decided not to drive to one of the designated car parks, as this meant I would have to cycle 5 miles to the start, and then cycle the 46 miles, which might have been a bit much. Another option, which I plumped for, was to take a specially laid on train from Richmond to Stratford. My husband kindly drove me to Richmond station for the 5.45am train – we left at 4.45am, as I thought there would be a queue of cars dropping o (there wasn’t) and I had thought the train ride would take 1 hour (it only took 30 mins),so I got there at 6.30am when my start time wasn’t until 9.08am. At the stations, I had to carry my bike down some stairs and at Stratford take the bike up an escalator, which was a bit scary. At Stratford, lots of other people were there early too, so there were people to chat to and to look after your bike while you popped to the port-a-loo. Participants were put into di erent ‘waves’ to start, and at8am I joined others going into the ‘M’ wave. We were in the ‘wave’for about an hour before we were finally allowed to start. The ‘wave’moved down very slowly towards the start and at one point, there were a couple of port-a-loos. I thought this would be a good time to use one as I didn’t know if there would be any others (there were),and the Scottish lady I was talking to said she would hold my bike for me. After a bit of queuing, I emerged from the ‘loo’ to find that the lady and my bike had completely disappeared. I panicked for a bit as I imagined having to tell all my supporters that I never started the event because I lost my bike, but eventually I found her/it, the‘wave’ having moved down much more quickly than I had thought it would. 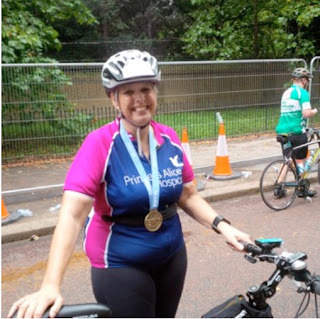 I am not an experienced or fast cyclist (average speed 11 mph), and I was worried that I wouldn’t get to Hampton Court (27 miles) in the time allowed, so I didn’t stop at all until I got there as I couldn’t bear to think I might not be able to complete the route. As it was, I need not have worried as there seemed to be lots of people behind me. weren’t going to move into someone else by mistake. I saw about 5crashes where this seemed to have happened. Consequently it was dicult to notice the surroundings as you cycled, although I do remember going past Trafalgar Square, the Ritz and the Houses of Parliament (obviously not in that order), and through Kingston market. There are three ‘hills’ on the route shown on the event map. One in Richmond Park (not that bad), Coombe Lane (I think) which is horrible, and Wimbledon Hill which is horrendous. After Coombe Lane for some reason I thought I had got up Wimbledon Hill – a couple who were also cycling for the Princess Alice Hospice spotted me at one point and slowed down to check if I was ok which was really kind of them – I proudly said I’d got up Wimbledon Hill only to be told I hadn’t got there yet which came as a bit of a shock –when Wimbledon Hill did appear, only bloody mindedness and lots of jelly babies for the sugar hit, got me up there without stopping,which I am quite proud of as lots of people got o and walked. After that the route was ok. The last five miles were really tough as the back of my neck started to hurt – I have never eaten so many jelly babies and bits of flapjacks as I did during those last five miles. Eventually the Mall came into sight and I finished! Then I collected my medal (a wonderful bit of bling) and retrieved my bag, which had been transported for me from Stratford to the Mall. It took a while to make my way to the other side of Buckingham Palace to be able to cycle down Buckingham Palace Road to Victoria Station (so many people), and I was worried that I wouldn’t be allowed on the train with my bike. But all was ok and I got to Leatherhead even being able to sit down, without being in other people’s way, while holding my bike (I don’t think I couldhave stood at that point for the 45 minute journey). I am really glad that I took part in the Prudential event, which was very well organized. Also wearing the Princess Alice Hospice cycling vest made a big di erence, as people cheered me on and that really helped me keep going. Did I enjoy it, people ask me? Not sure.It was one of the toughest things I have done, but I enjoyed being able to bomb down the hills knowing that no tra c was going to pull out in front of me (my Garmin said I did 29mph at one point). I am proud that I managed to finish, taking 4.5 hours altogether, and I would again like to thank those who helped me raised over £700 for the Hospice. Roll on the next challenge! An Open Committee meeting at 7.30 in G6 of the Letherhead Institute. 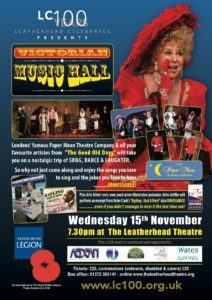 Chairman’s report (CB) – Transform Leatherhead Public Forum on 1st November, Church Street, our Website and the Hawks Hill Waterworks. Arrive by 7.15 if you would like to speak to the Chairman about any issues. This is an unusual wild area adjacent to Leatherhead hospital, where children can ride bikes along muddy tracks, build jumps and create dens, and dogs can be walked off the lead. Many of you will remember the efforts put in by both Residents and by our energetic former member, Flip Cargill, who secured a Village Green Listing for Leach Grove Woods. Tim Jones, who has lived in Leatherhead all his life took over the fight when after Flip had left area, the owners, NHS Property Services Ltd challenged the designation by Surrey county Council. Sadly, in 2016 a court case decided Surrey had been wrong to designate the area a village green because it was owned by the NHS. 2) the recreational use of the land would be incompatible with that purpose. The Appeal will be heard at the High Court on 4th-5th October to decide if it is legally permitted for a public body to have land they own registered as a village green. Tim is asking for support, to bring this important case to the Court of Appeal in the hope of stopping a dangerous precedent being set and, of course, to protect Leach Grove Woods too. Tim’s lawyers are acting on a conditional fee arrangement which means that if they lose the case in the Court of Appeal they will not get paid, and Tim will have incurred expenses and will have to pay up to £10,000 towards the NHS’s costs. Please click on the underlined link to read the Epsom & St Helier Involvement Document and questionnaire. 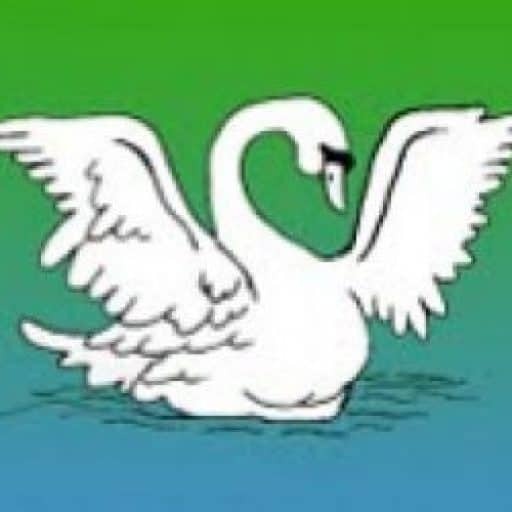 Chairman’s Report (Caroline Brown) – Epsom Hospital, the Royal Oak and the latest Police report. Our Speaker: Councillor Simon Edge, who represents Bookham South, but who is also on the Mole Valley Executive Committee for the Economy and for Transform Leatherhead.